It is important to remember that low, average, and high scores on a personality trait questionnaire are neither intrinsically good nor bad. A particular level on any trait will probably be neutral or irrelevant for most activities, helpful for accomplishing some things, and detrimental for accomplishing others. As with any personality test, scores and descriptions can only approximate your actual personality. Whilst all of this may be true, in the real world your test results will have a significant influence on your chances of being rejected. The following is an example 16-factor personality profile. The interesting thing is that the individual who completed the questionnaire on which the profile is based has been successfully working in sales for over 20 years. If she was looking for another sales job, her high score on the 'trusting' scale would almost certainly mean that her negotiating abilities would be ‘red-flagged’. How could someone intrinsically so 'trusting' be an effective negotiator? If she was lucky and her previous track record was taken into account, she may get the opportunity to explain how she has managed to cope successfully in sales despite the high 'trusting' score. More likely, in a field of other strong candidates, it would be enough to put her out of the running. In case you are wondering how someone with a background in sales could be so 'trusting', it is worth repeating that the questions in these personality tests are open to personal interpretation and because of the time constraint there may only be a few questions to determine each personality factor. If her interpretation of two or three questions did not match that of the test designers then this would be enough to produce an flawed result for that particular factor. Human resources professionals would argue that personality questionnaires are not used in isolation and that they form only part of the whole selection process. This is true as far as it goes, but you only need to look at the arithmetic of the recruitment process to see that the overwhelming majority of candidates need to be rejected for one reason or another. It would be very difficult to argue that such apparently ‘objective’ evidence would not be a factor in that decision. Unlike the interviewer, who rarely produces more than a page or so of often hastily written notes, commercially available personality questionnaires produce very authoritative looking documentation. Imagine the scenario if she did turn out to be a poor negotiator. “You mean to tell me that we employed this person when we had clear documented evidence that she was unsuitable.” How many people would take that risk? These for dimensions can be grouped in a grid as shown. Note how "D" and "I" share the top row and represent extroverted aspects of the personality, while "C" and "S" below represent introverted aspects. "D" and "C" in the left column and represent task-focused aspects, and "I" and "S" in the right column and represent social aspects. In this matrix, the vertical dimension represents a factor of "Assertive" or "Passive", while the horizontal represents "Open" vs. "Guarded". 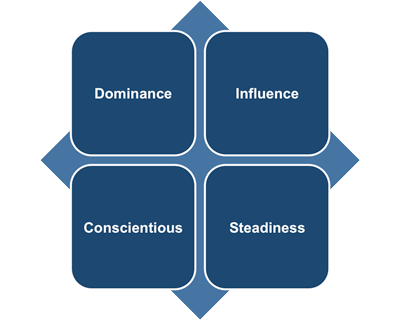 * Dominance: People who score high in the intensity of the "D" styles factor are very active in dealing with problems and challenges, while low "D" scores are people who want to do more research before committing to a decision. High "D" people are described as demanding, forceful, egocentric, strong willed, driving, determined, ambitious, aggressive, and pioneering. Low D scores describe those who are conservative, low keyed, cooperative, calculating, undemanding, cautious, mild, agreeable, modest and peaceful. * Influence: People with high "I" scores influence others through talking and activity and tend to be emotional. They are described as convincing, magnetic, political, enthusiastic, persuasive, warm, demonstrative, trusting, and optimistic. Those with low "I" scores influence more by data and facts, and not with feelings. They are described as reflective, factual, calculating, skeptical, logical, suspicious, matter of fact, pessimistic, and critical. * Steadiness: People with high "S" styles scores want a steady pace, security, and do not like sudden change. High "S" individuals are calm, relaxed, patient, possessive, predictable, deliberate, stable, consistent, and tend to be unemotional and poker faced. Low "S" intensity scores are those who like change and variety. People with low "S" scores are described as restless, demonstrative, impatient, eager, or even impulsive. * Conscientious: People with high "C" styles adhere to rules, regulations, and structure. They like to do quality work and do it right the first time. High "C" people are careful, cautious, exacting, neat, systematic, diplomatic, accurate, and tactful. Those with low "C" scores challenge the rules and want independence and are described as self-willed, stubborn, opinionated, unsystematic, arbitrary, and unconcerned with details. Your personality profile is no use to employers unless they have some way of knowing how your it compares to the requirements of performing well in a particular role. Before the results can be used to select suitable candidates for a particular job, results of similar questionnaires must be produced in the population as a whole and also for those people already working successfully in the relevant job.